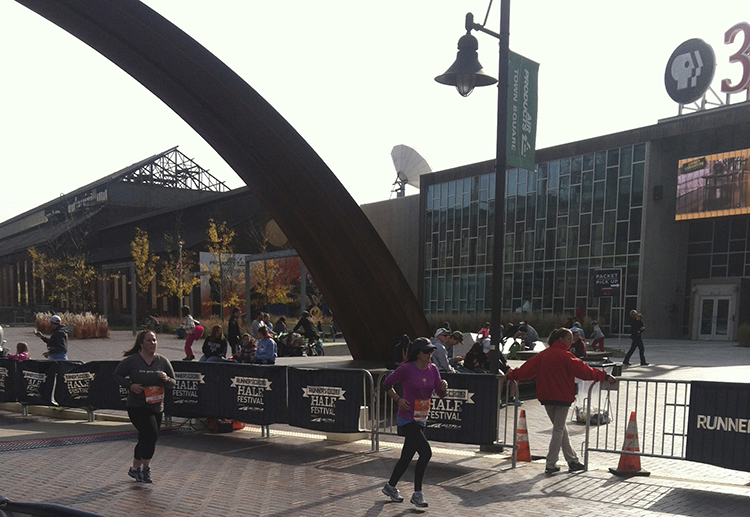 Stride and Joy | An Aussie in Boston learns to run. And tries not to fall down. 1. I can finally take that seat on the train right next to the door (you know the one) without feeling like I am going to get hairy-eyeballed by a little old lady. 2. I can enjoy watching my belly expand without worrying that it’s from too many dirty gin martinis. 4. I can spend inordinate amounts of time online looking up things like “breast pump bags that aren’t completely hideous” and “baby wall art that doesn’t make me want to barf” without feeling as though I am wasting my life on the internets. 5. My hair is awesome. I know it’s about to all fall out, but I’ll take it for now. 6. People are amazingly, astoundingly generous. 2. The puffy jacket. It must be the least unflattering item of clothing I have ever put on my person. And I have spent a decent amount of time in running tights with shorts over the top. 3. I have been told that I am tiny. I have been told that I am big. I wish people would make up their minds. Or better yet, just stop commenting on my size. I don’t tell you you’re having a fat day. 4. I am at my sleepiest at 3.30 in the afternoon, which of course always seems to be just before a big meeting. That’s all for now. Wish me luck! OK, perhaps not. But it sure does look that way. For the past couple of months, it’s been couch city for the most part, although I have been working out on Hubby’s new Elliptigo, which we turned into a stationary trainer (more on that later). I was swimming, but then our YMCA sprung a massive leak and ended up shuttered for three months. Perhaps it was a sign. I thought about yoga, and then thought about it some more. But by the time I get around to going to a class, this kid is going to be ready for higher education. I’m just not cut out to be bendy, especially not now, when putting on my shoes is about as unattainable as doing crane pose. I fully intend to be back out there when I can (Stride & Bundle of Joy? ), red-faced as ever, jogging stroller at the ready. Until then, happy 2014, everyone! May the road rise up to meet you. 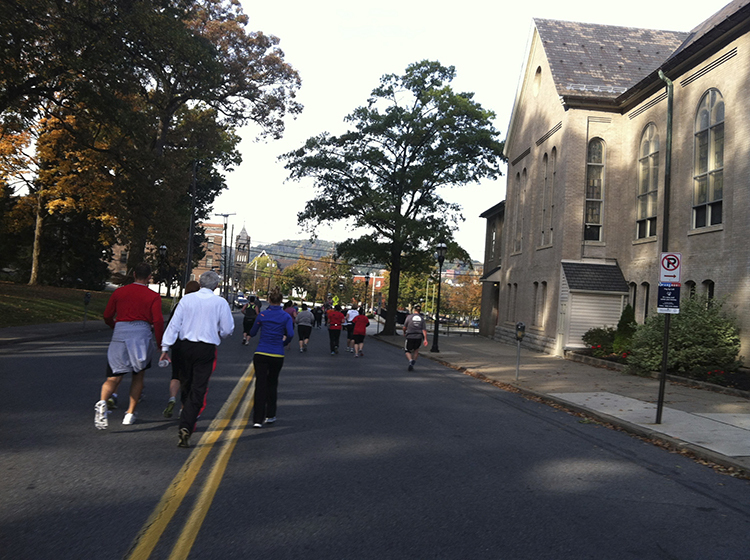 Given that Runner’s World CRO Bart Yasso is currently stalking my husband (seriously, he seems to be at EVERY one of Hubby’s runs), it seemed only fitting that we should go to the Runner’s World Half and Festival in Bethlehem, PA.—Yasso’s hometown—last month. OK, so I may have got that stalking bit backwards, but we were pretty excited about this event. Hubby especially, because he got to do the Hat Trick (there was even a hat to mark the accomplishment)—a 5K, 10K, and half-marathon over the two days of the fest, otherwise known as running for crazy people. I, on the other hand, was signed up for the 10K, which was possibly 10K more than I should have been signed up for, but it seemed like a good idea at the time. 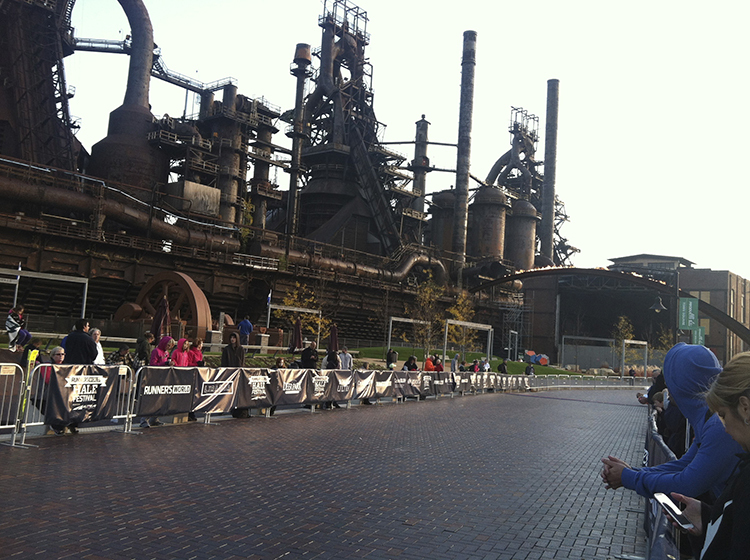 Runner’s World Half Marathon and Festival at the SteelStacks in Bethlehem in Pennsylvania. The festival was held at the SteelStacks, a cultural/recreation center that has been developed in the shadow of the former blast furnaces of the Bethlehem Steel Plant (Bethlehem is an old steel town that is being revitalized). It made for a very cool backdrop. I love how we keep winding up at these places we would never have visited otherwise. Bart Yasso has a saying: “Never limit where running will take you.” (When he autographs something, he signs that. I know this because of the stalking.) It’s so true. I put my name down for the 10K long before a 10K became out of my grasp due to a lack of preparation and other reasons. But I didn’t want to be a piker so I figured I’d do what I did for the Wineglass Half and walk the majority of it (the Wineglass tech shirt got quit a bit of love as I was waiting at the start). Man, why is 10K so far all of a sudden? This run seemed to take an eternity. The route was great, very pretty, and flat, but such. a. long. way. I’ve done two half-marathons in the past few months, and it STILL seemed like I would grow old and die before I finished this race. Man, I really need to start running my runs again. 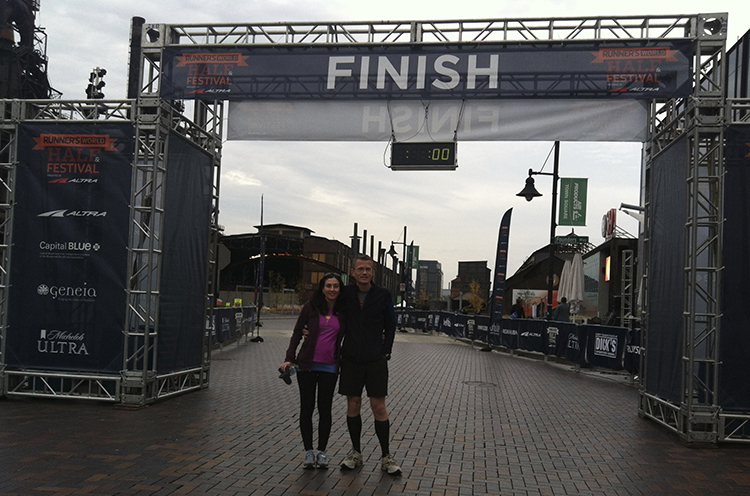 When I got close to the finish, Hubby met me to encourage me in (read: give me a shove), which meant I went from a walk, to a slightly faster walk, to a sort-of run across the finish line. He even managed to capture some pictorial evidence of my, er, triumph. Check me out, I’m, um, running! I don’t look like a moose from this angle. Apart from the 10K torture, the festival also had a bunch of panels and keynote speakers (Dan McGilvray, who directs the Boston Marathon, was there). We went to a few, including a talk by Yasso himself about his life on the run. The man is one compelling speaker. He’s a lot of fun to listen to, and very passionate about what he does. I mean, his title is chief running officer! Everyone should make sure they get to one of his talks. Oh, and there was also a dog run. You’ve got to love an event that has a dog run. Hopefully we’ll be back next year. And hopefully by then I won’t feel like a complete running fraud! One of us is a real runner. Can you guess who? 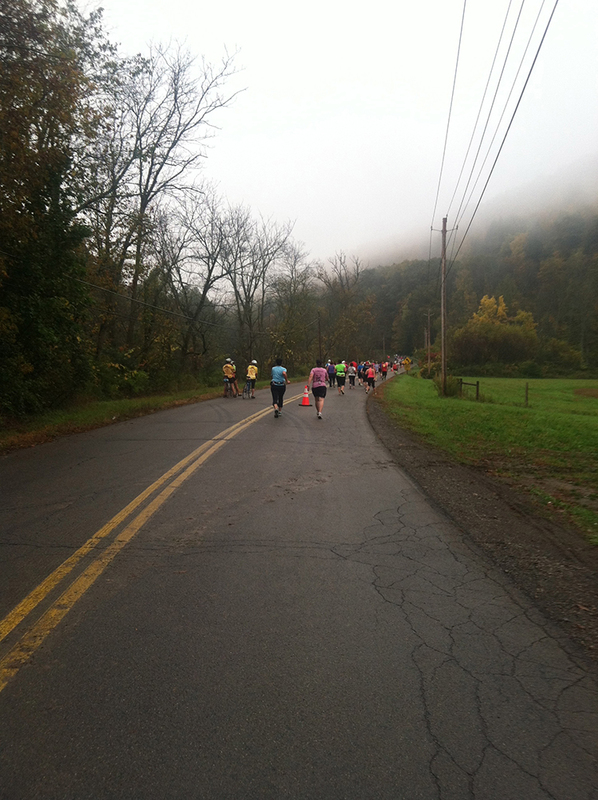 Last year, I ran the Wineglass Half Marathon in Corning, New York, and did pretty OK. Of course, “pretty OK” is all relative, and my version of it is probably many other people’s “not so hot.” But I I set a PR that I have a feeling I’ll never be able to beat, and I was really happy. The Wineglass is my kind of run. It’s mostly flat or downhill and you get a free glass and a bottle of bubbly along with the shirt and the other bits and pieces. No wonder I set a PR. Although, the PR may have had something to do with the fact I had spent 2012 running so many races every weekend that I had by default trained for that one (shock! ), but still, bubbly booze is a powerful motivator. 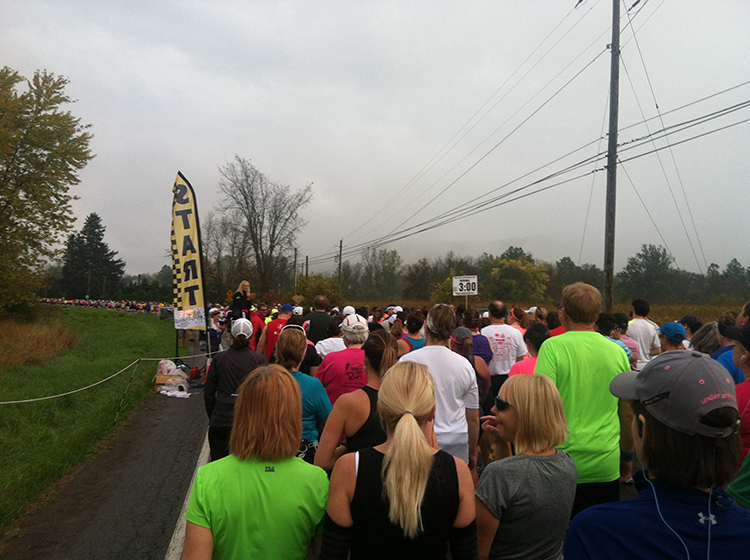 Smooshed way in the back at the Wineglass Half Marathon start. 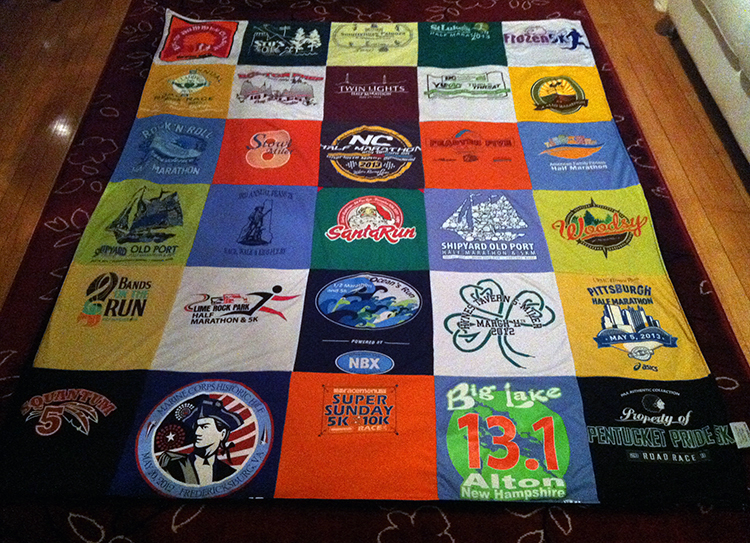 This year, Hubby had the brilliant idea of suggesting this race as a destination run for our group at the Quincy Y. There ended up being nine of us who traveled from Boston. So fun! The rest of the group like to do wild and crazy things like train consistently, which means they were all infinitely more prepared than I was, so I said goodbye to them and sneaked into the back of the pack where I belonged (Hubby and our trainer Mary were doing the full marathon). Last year, I was propelled to the finish by the 2.30 pace runner, but once you consign yourself to 3:00 and above, I feel like you’re pretty much on your own. 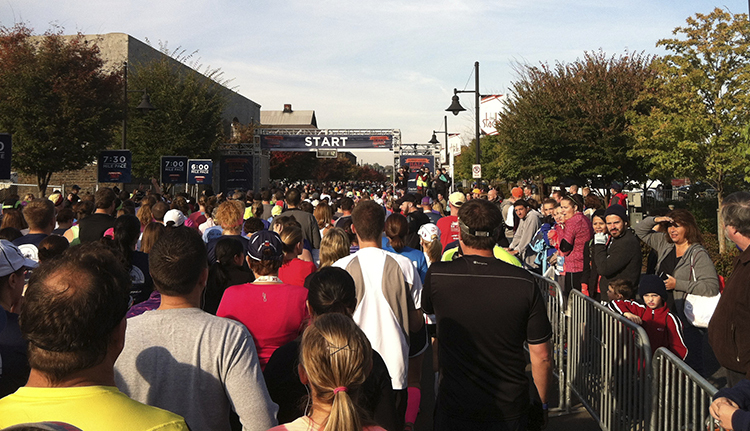 I had decided that I was going to mostly walk this one, as I didn’t want to injure myself coming into the race cold. Unfortunately, there’s no such program as Couch to Half Marathon in Two Weeks. I could really use one of those. I guess I should learn how to bake. I remembered this course really well from last year, and I remembered exactly where I was before I finally petered out and had to walk. 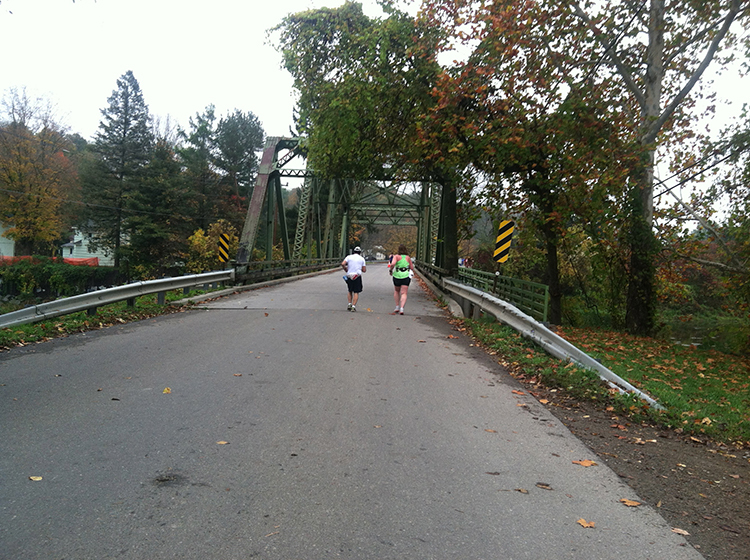 It was at about the nine-mile mark. Man, nine miles is a long way when you’re walking as slowly as I was this time around. And don’t even get me started on 13.1. 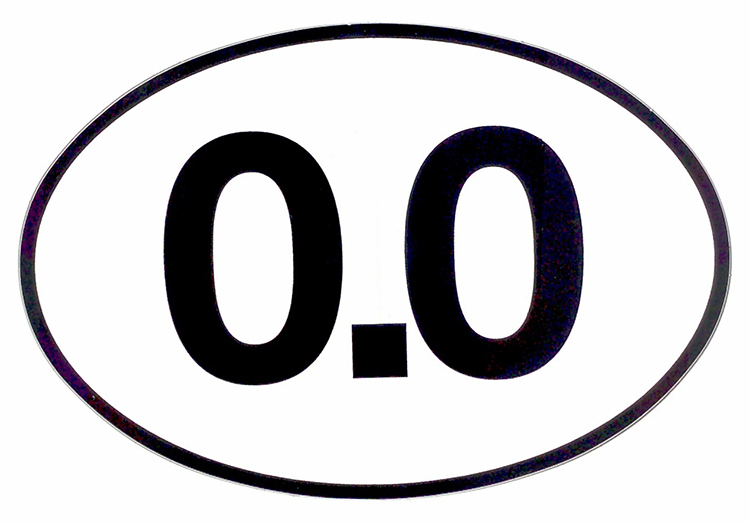 For the first time in many, many races I felt … and I can’t believe I’m saying this … kind of bored. Don’t get me wrong, this is an amazing event. I love it and would happily do it every year regardless of the shape I’m in. But it was tough for me for many reasons. Thank goodness it’s pretty. I was out there long enough. I kept going even though my legs were turning to jelly and my brain to mush. I was so relieved when I turned the second-to-last corner that I even broke out into a little jog (that may have been mostly for the camera), but I couldn’t sustain it. For the first time ever (apart from the Mad, where I was in a walkers division), I resigned myself to walking across the finish line. But that’s OK. 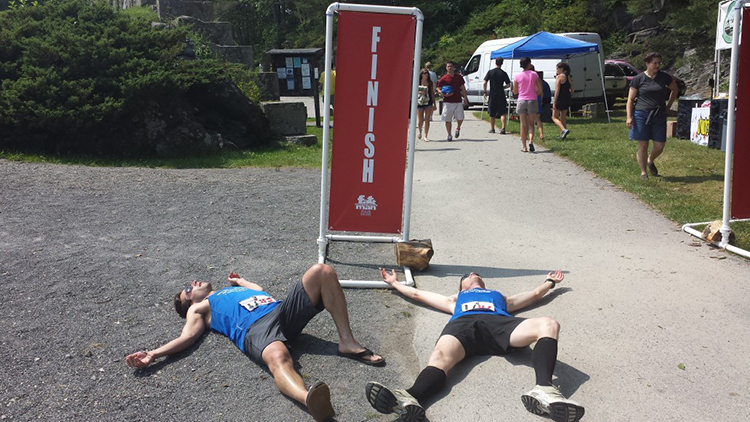 I was just so glad to cross it that I didn’t really care that the race wasn’t my finest hour. All the others from the Quincy contingent did amazingly well, and everyone had a great weekend. I’ll toast to that. In August last year, I arrived at the Lululemon SeaWheeze Half Marathon in Vancouver, British Columbia, with 30 or so races under my belt thanks to my 52 Weeks, 52 Runs challenge. So, even though I hadn’t exactly “trained” for SeaWheeze 2012 (faithful readers will recall my general crapness at sticking to any kind of training regimen), I felt prepared in an at-least-I’m-not-completely-out-of-shape-and-at-least-I-look-the-part kind of way. 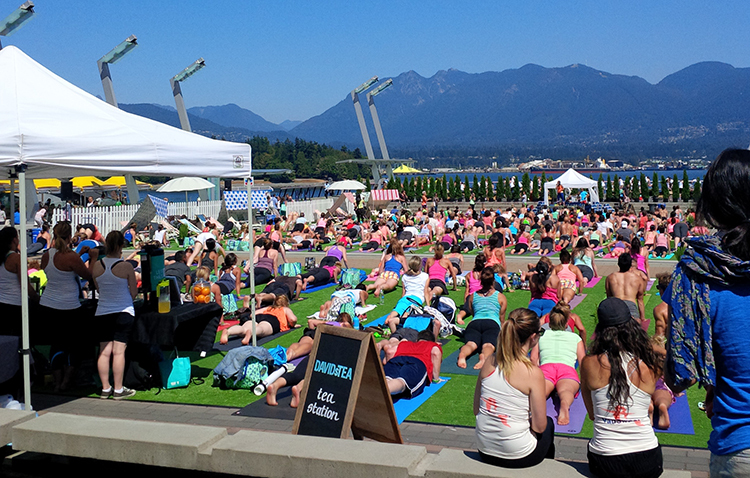 One of the free yoga classes SeaWheeze put on the day before the run. The weather was beyond gorgeous. Look at that sky! Fast-forward to last weekend. I had been looking forward to SeaWheeze 2013 for a number of reasons. 1) You get cute (but teeny) shorts in the mail to train in. (Ha!) 2) You get to hang out in Vancouver in the middle of summer, which is lovely, even if for one weekend the city looks as though Lululemon threw up all over it. 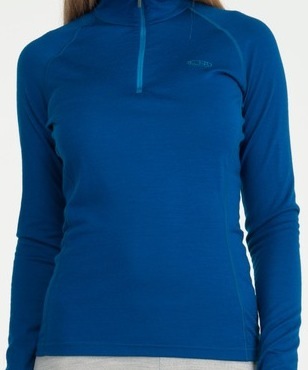 3) You get to shop in the exclusive SeaWheeze store, which is fun if damaging to the wallet (good thing we did the entire trip on points), and you end up with clothing in colors you may not have considered in the past: namely, orange. 4) You get free stuff like massages and yoga classes. (OK, so unlike Hubby, I didn’t avail myself of either, but I could have.) 5. And you get to go to the half-marathon after-party/concert, which this year was in Stanley Park and featured Xavier Rudd (I have no idea who that is, but apparently he’s Australian and kind of a big deal). 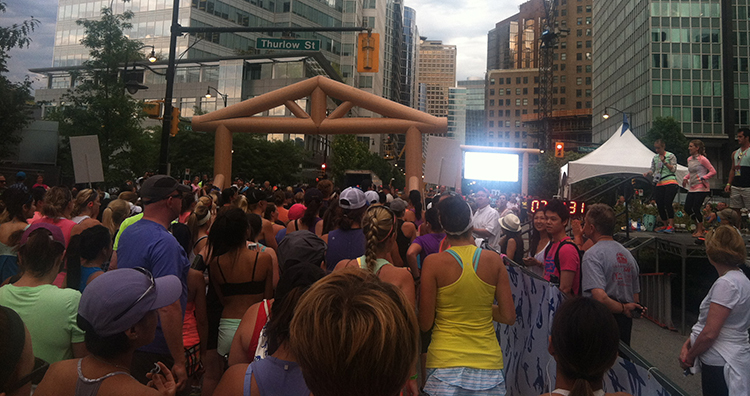 The SeaWheeze 2013 start. I was in the too-far-back-to-care-about wave, which, as usual, meant no speakers, so we had no idea what was going on until we finally got to the front (40 minutes later). At least we got a countdown and a Mexican wave this year. So, it won’t surprise anyone to learn that I wasn’t in shape for this race. I think I made peace with that fact about 30 minutes after I decided to throw myself into training (SeaWheeze puts out a very cool TackleBox schedule for runners) while I was at home in Australia. (I got bored.) I do better with racing-as-training. Hubby is the same way. I also wasn’t nearly as snappily dressed as I could/should have been. I forgot this run doubles as a giant advertisement for Lulu. I’m surprised they don’t funnel those of us not in the current season’s colors and styles to another event entirely. Or kick us out of the city.